Could there be a Flu epidemic in the United States,. turning into a deadly world Flu pandemic possibly in 2019-2020, as the Fourth Horseman of the Apocalypse Death in Revelation 6:8 rides? And note that this is 100 years since the 1918 worldwide Flu epidemic. Relate H3N2 to Revelation 3:2 "Be watchful, and strengthen the things which remain, that are ready to die:". So there is concern that there could be a worldwide epidemic in 2019 or 2020. This could be the Fourth Horseman of the Apocalypse Death riding. An increasing danger of an Influenza epidemic in 2019 - 2020. 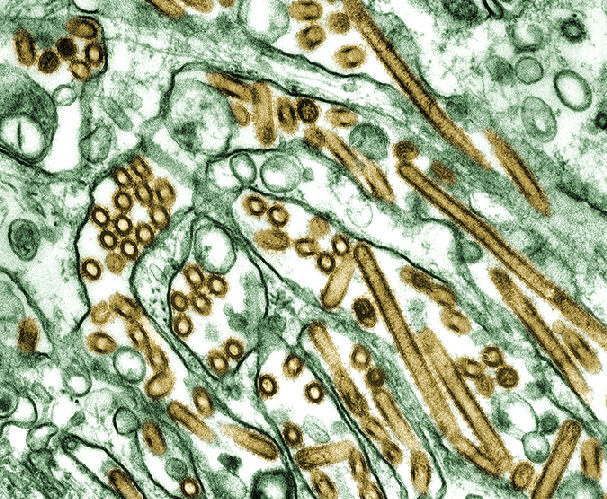 There is a concern that swine or Bird flu could mutate, and cause a deadly global flu pandemic in 2019 or 2020, similar to the 1918 flu epidemic. Does this mean there could be a deadly flu season in 2019-2020? Origin of the deadly 1918 H1N1 Flu: According to the book "The Great Influenza", (by John M. Barry, published by Penguin Books, 2004, 2005), the 1918 Flu probably began in Haskell County, Kansas, in about January 1918. This occurred to me: one of the towns in Haskell County is Satanta, Kansas. Note the similarity to "Satan". Note that the 2009 Swine Flu seems to mainly have caused illness in people under 60, very few people over 60 got it. This could be because there were mild H1N1 Swine Flu epidemics in 1947 and 1951, that people over 60 still have swine flu immunity from. Also, the 1977 Flu epidemic was H1N1, it may give partial immunity to people born before 1977. And in Revelation 6 there are the four horsemen of the Apocalypse, one of the visions predicted for the future in Revelation. These 4 horsemen are predicted to ride during an apocalyptic period with wars, weather changes, earthquakes, plagues, economic disaster, etc. The Fourth Horseman rides a pale horse, whose rider is named Death, and Hades (Hell) rides with him. It is believed by some writers that the fourth horseman Death is associated more with death by disease: (AIDS, Ebola, Influenza, and SARS or MERS possibly). On this web site, where among my prophecies, I also discuss events in the world, including diseases, from the point of view of Astrology, Biblical prophecy including the Book of Revelation, and numerical analysis. The Four Horsemen of the Apocalypse may ride now, including the Fourth Horseman Death by disease, which could be Influenza, Ebola, AIDS, SARS,and other diseases. Let us consider here three diseases that are a threat to mankind: AIDS, Ebola, and Influenza. The virus that causes AIDS, HIV, was discovered in the year 1983, so therefore associate AIDS with the number 83. The galaxy M83 is in the constellation Hydra, which was a multi-headed serpent in mythology that kept growing a new head, each time a head was cut off. This sounds like AIDS, which keeps mutating to allow it to get around any treatment or vaccine. The Hydra was defeated by Hercules, by his nephew Iolaus burning each of the mortal heads as Hercules cut them off, and burying the immortal head under a stone. I wonder if this mythology story could somehow be a clue on how to treat AIDS? Note that the AIDS virus has 9213=111x83 bits of genetic information, so again the number 83. Note that the Hydra mythology also applies to Osama bin Laden's terrorist network, which seems to keep regrowing itself in new countries after it was eliminated in Afghanistan. Influenza or "Flu" was discovered in 1933. Galaxy M33 is in the constellation Triangulum. That may imply we should look for a triangle. The numbers 33, 76, and 83 do form a right (90 degree) triangle with an angle of 66 degrees. Since 666 is the number of the antichrist of the Book of Revelation chapter 13, this may imply that these three diseases will threaten humanity when he is in power (and I think he already rose to power, as President Putin of Russia. These diseases may also relate to three animals used to describe the Antichrist in Revelation 13:2: he is like a leopard, has the mouth of a lion, and the feet of a bear. Maybe Ebola corresponds to the leopard, with its great speed; Ebola kills in two weeks of infection. Influenza could be the lion; it causes coughing like a lion's roar. And AIDS could be the bear; bears hibernate, like AIDS can do in people, until it wakes up and kills them. Concerning the flu, note that a previous deadly strain was type H3N2 Fujian, which had come out of China, as well as bird flu A(H5N1) which began in Vietnam in Dec. 2003, but originally had come out of Hong Kong China in 1997. 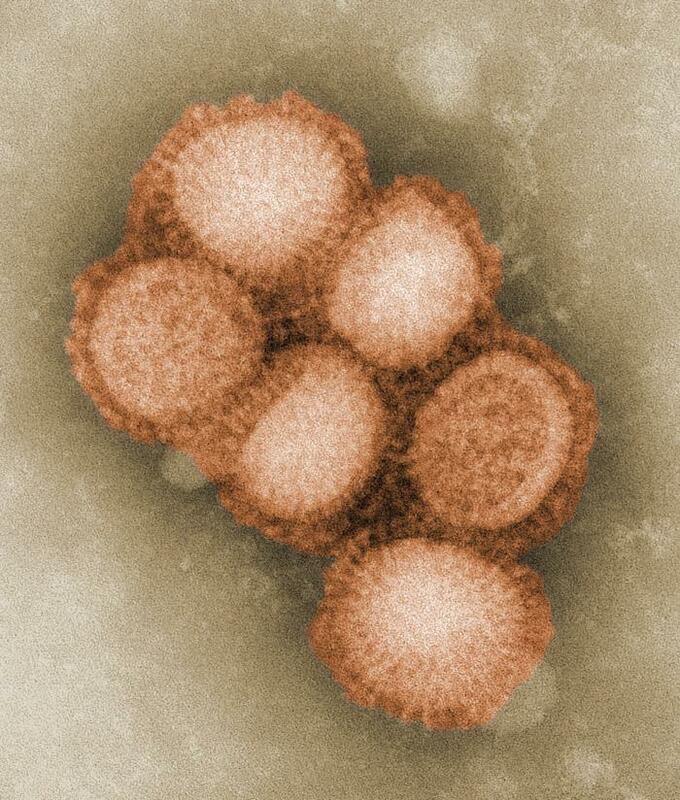 There is a concern that the H1N1 swine flu could get genetic material from Bird Flu and become more deadly. This is significant, since I think China is the Red Dragon in prophecy, in Revelation 12, with the Red Dragon also being Satan. And in Revelation 13 the Antichrist gets his power from the dragon. "And the beast which I saw was like unto a leopard, and his feet were as the feet of a bear, and his mouth as the mouth of a lion: and the dragon gave him his power, and his seat, and great authority." Also, in Revelation 16 demons or unclean spirits are sent out of the mouth of the dragon (China), SARS being one of these demons (it came out of Hong Kong, the lion's mouth of the dragon), and the bird flu came out of the mouth of the China dragon in 1997. "13 And I saw three unclean spirits like frogs come out of the mouth of the dragon, and out of the mouth of the beast, and out of the mouth of the false prophet. 14 For they are the spirits of devils, working miracles, which go forth unto the kings of the earth and of the whole world, to gather them to the battle of that great day of God Almighty." And note Revelation 18 refers to "unclean and hateful bird", since bird flu could cause a deadly Flu epidemic. "18:1 And after these things I saw another angel come down from heaven, having great power; and the earth was lightened with his glory. 2 And he cried mightily with a strong voice, saying, Babylon the great is fallen, is fallen, and is become the habitation of devils, and the hold of every foul spirit, and a cage of every unclean and hateful bird." "...a disease plague will result in the deaths of more than two-thirds of the people in the world. It will be difficult to determine the true owners of fields and homes, and weeds will be growing in the streets." Could this mean some future plague such as Ebola or Swine Flu will depopulate 2/3 of the world's population? The "Bible Code" is a way of looking for hidden prophecies and passages in the Bible, by using a software program to search for messages in the Old Testament Hebrew text. The spaces between words are eliminated, so that the Old Testament is a continuous block of Hebrew letters. Then, by skipping letters at a programmed interval, the program searches for words. There appear to be patterns to the passages where the words are found. This page on the King James Bible Code discusses research I did on an English Bible code in the King James version Bible. By using Bible code software I searched for some words in the King James New Testament and Old Testament (separately). I found that there is evidence of English Bible code patterns that the software found by skipping varying intervals, in the King James Old Testament or New Testament, made into a block of solid text. Here I show some King James Bible Code matrices on H1N1 Swine Flu. I searched for a New Testament Bible Code matrix on H1N1 Flu, by spelling out H1N1 as H-ONE-N-ONE. 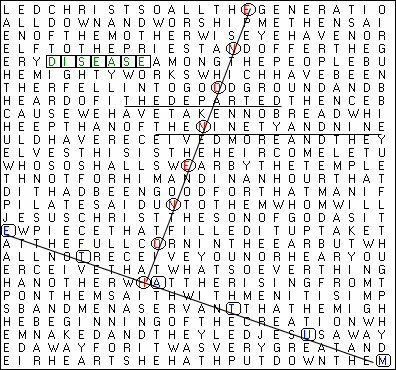 This matrix contains search words HONENONE, DISEASE, MUTATE, and is at Matthew 1:16 to Luke 1:52. It is interesting that "THE NINETY AND NINE" appears in this matrix, 666 the number of the Antichrist in Revelation 13, upside-down. Also in this matrix is "THE DEPARTED". This matrix could relate to the 9-9-9-9 astrology pattern on Jan. 7 2013 discussed on the calendar pages, the 2013 Flu epidemic was in the news then. This could indicate that H1N1 Flu or H7N9 Bird Flu could mutate into a deadly epidemic in 2019 - 2020. This next Old Testament matrix was at Exodus 12:3 to Exodus 12:37, which is interesting since that is the section of the Plague of the Firstborn in Egypt, which could have been a deadly Flu epidemic. The search words in this matrix are HONENONE and VIRAL. In Feb. 2014: Bird Flu outbreak in China, with some human deaths, H7N9 virus strain. The concern is that it could become a deadly human epidemic, the Fourth Horseman Death riding. This page has a King James version Bible Code matrix on it. Also, see this King James Bible Code pages for matrices on diseases including Flu.